When Cardinals rookie Paul Dean learned to mix his pitches, hit the corners of the strike zone and quit trying to emulate his larger-than-life older brother, he became an effective starter for St. Louis. 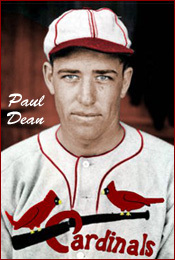 In 1934, Paul Dean, 21, debuted with the Cardinals, won his first eight decisions and went into the All-Star Game break with a 10-4 record. Paul Dean’s brother, Dizzy Dean, 24, was the ace of the 1934 Cardinals staff. Paul entered the Cardinals’ 1934 spring training camp as a candidate to join his brother in the starting rotation after posting a 22-7 record in 1933 for minor-league Columbus. During that 1934 spring training, Dizzy brashly predicted he and Paul would combine for 45 wins for the Cardinals that season. Though well-intentioned, the remark put added pressure on Paul. Some Cardinals veterans already thought Paul wasn’t ready for the big leagues and was being given preferable treatment in spring training because he was Dizzy’s brother. Paul didn’t help matters with his combative nature. He feuded with first baseman Rip Collins and coach Mike Gonzalez and later got into a fight with outfielder Joe Medwick. Paul made the Opening Day roster for the 1934 Cardinals. He yielded eight earned runs in six innings over his first three appearances and had an ERA of 12.00. In his next start, May 3 against the Phillies, Paul got his first big-league win, but he wasn’t sharp, yielding five runs in five innings in an 8-7 Cardinals victory. Paul’s next start was scheduled for May 11 against the defending World Series champion Giants and their ace, Carl Hubbell. Speculation was Paul would be sent to the minor leagues if he didn’t pitch well in that game. A few days before the showdown, Frisch invited Paul to join him for dinner. Over porterhouse steaks, Frisch, who began his career with the Giants, explained to Paul how to pitch to each Giants batter. Frisch also told Paul to be himself, trust his talent and use the off-speed pitch he’d been learning. Paul became a consistent winner. Through May 31, Paul was 5-0, Dizzy was 6-2 and the Cardinals were in first place. On June 1, Dizzy was scheduled to start against the Pirates. Instead, he staged a strike, refusing to pitch until the Cardinals gave his brother a $2,000 pay raise. Paul’s salary was $3,000. Dizzy’s salary was $7,500. Dizzy ended his walkout the next day. Paul won his next three decisions, boosting his record to 8-0 with a shutout against the Phillies on June 17. After beating the Giants on June 26, Paul was 10-1 with a 3.92 ERA. He lost his next three decisions before the July 10 All-Star Game. The Dean brothers continued to win in the second half of the season, especially in the September pennant stretch. Paul was 5-3 with a 1.93 ERA in September; Dizzy was 7-1 with a 1.54 ERA that month. The Cardinals won the pennant with a 95-58 record, finishing two games ahead of the Giants. Dizzy was 30-7 and led the NL in strikeouts for the third consecutive season. Paul was 19-11 with 16 complete games and five shutouts. With a combined 49 wins, the brothers had exceeded Dizzy’s prediction. In the World Series, Dizzy and Paul each won twice, leading the Cardinals to the championship over the Tigers. In Paul’s two starts, he pitched complete games, yielding two earned runs in 18 innings.